Many people consider Nack Ballard to be the greatest backgammon player that ever lived. He has been consistently at or near the top of the Giants of Backgammon list (an expert poll, taken every two years since 1993). 1982: Nack wins the World Professional Championship in Las Vegas, the strongest tournament held in that era. 1984: Nack is voted No. 1 in the world in a poll conducted by Kent Goulding at the US Invitational in Washington, DC. 1985-1993: Nack takes a break from backgammon and becomes one of the best Caucasian Go players (5-dan). In 1990 Nack becomes one of the top Scrabble players in the world, maintaining a rating over 2000 until he retires from Scrabble and returns to backgammon three years later. More recently, he became the top Color Lines player in the world. 1999: Nack crushes the strongest computer program in the world in a famous documented $200/point match (no tricks), netting 60 points in 300 games. Nack has also contributed several variants and adjuncts to backgammon, the most popular of which are: Nackgammon, Nactation, Naccel, and Kangaroo count. At the age of 17, I was hustling chess for quarters in the North Beach area of San Francisco. I discovered speed chess tournaments (with several masters) played in the basement of the Gambit Game store. I started directing them, and the owners made me proprietor of the game room in exchange for no gaming fees. Among the tables where chess, Go and sometimes Scrabble. I noticed a weird game (that I had only seen on the back of a checker board) being played with checkers and dice. When I saw money change hands, I became hooked and started playing for one cent a point. Fortunately, I was still a kid, so people were very accommodating. By the time I worked my way up to 10 cents a point, I was winning enough to support myself. (Hey, rent of $83 a month, $2 mealsthis was the 70s, man.) There was a wonderful German fellow with an unquenchable spirit named Klaus who smoked a constantly pivoting pipe and would sometimes drop a hundred points to me in his lunch hour; that went a long way. Go. I wish I'd learned it when I was younger. In Asia, kids learn it when they are four years old, become disciples, and turn into awesome professionals. Ah, in another life! I'm respected for my Go over here, but from the standpoint of the top players in Asia, I'm just another clown. That doesn't stop me from playing over the games of the masters when I have time. That is my most pleasurable gaming experience. 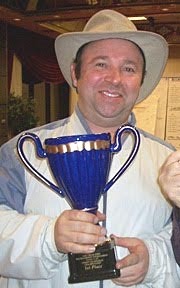 Thinking back, I suppose the most exciting was my finals win over Sandy Lubetkin in Vegas one year because, not only was it close, but it was on the heels of close matches with Kit Woolsey and Berj Abadjian (semis), where I was nearly drawn dead both times in key games before a combination of their dice and mine turned it around. I support match-recording rights exclusively by tournament directors so that they can supplement their income by selling matches, and gain sponsorship through live backgammon broadcasts, etc. Gammon Million had the right idea here; they just didn't stick around long enough for all of us to see the benefits. This would increase badly-needed director incentive, helping to ensure the survivability and growth of backgammon, and eventually lead to added money. At the same time, I believe that an individual should have the right to decline having his match recorded by anyone other than the directoropponent or otherwise. At the moment, the latter issue seems to still be in a gray area, but I dislike the way the trend might be moving. Clocks. (a) To prevent time abuse, and (b) To aid the mechanics of playing with one set of dice, as two sets lead to more disputes. I have been lobbying for clocks for decades; I'm happy to say that great progress has finally been made recently. Breaks. When clocks are used, I think breaks should be factored into a player's time. (Exceptions can be made for the physically challenged.) For example, instead of giving a player 22 minutes of reserve time in a 11-point match, give him 33 or whatever. Players should go to the bathroom and whatever else before a match begins, and if they need another break they can use the additional reserve time for that. Breaks are a hidden drag, causing the worst stalls in tournaments. What typically happens now, clock or no, is that the player wants a break, and then another, and anotherbathroom, smoke, phone call, bathroom again. Some tournaments limit the breaks to one or two per match, but even then each rule-stated 10- or 15-minute break can turn into 30 or 45 minutes (worse in some countries). Touch move, as implemented in chess, or a slight variant I call "motion move." For what game other than backgammon do you get to try a move on the board, take it back and try another? This is basically stealing a one-move look ahead at the expense of the other player who is no longer looking at the actual position, loses focus in his own strategic conceptualizing, and has to track your fake moves. "Touch-move" means that if a player touches a piece he has to move it (if he legally can). "Motion-move" means the same except you are uncommitted until you put the piece into motion. Either way is fine. A tolerable compromise or transition might be the one-shuffle rule: a player gets to make one complete (or partial) move and, once he has reset the original position, it then becomes touch-move. Also, whether it's the one-shuffle or the (current) infinite-shuffle rule, a player should "offset" the checkers (move them to a high part of the destination point) to minimize the chance of a dispute. In Chicago, about ten years ago, I was captain in a strictly non-consulting chouette. I had hit two checkers and was on the way to a closeout. I needed a 4 to escape a prime with several rolls of timing to do it, but I didn't get the 4 until I was close to cracking. Suddenly, I rolled double 4s, which escaped and hit a third checker outside, winning a likely gammon. However, I found a different play: I broke my 6pt and 5pt, reducing my five-point board to a crushed three-point board and turning my spare into a blot. True to our chouette code, my team members Malcolm, Senk and Harvey (as I recall) conveyed neither the slightest sound or body language while I googol-whoppered our game away. KG's only comment, as he redoubled (a cube we couldn't take) was, "What number were you hoping for?" In a nightmarish moment of realization, I quietly excused myself and went to bed (by the way, leaving behind my leather jacket in the bar area of the hotel, which I never saw again). That's easy: Nackgammon. The percentage chance of beating a lower-rated player is higher when games are more complex. To be clear, I don't play Nackgammon to maintain a high rating. I just enjoy it more than backgammon so I play it more. GridGammon probably has at least one NackBlitz a daygreat fun. You have written a great book with Paul Weaver, Backgammon Openings, Book A. Are you working on the sequel? In a divide-and-conquer strategy, Paul is continuing with the non-doublets (e.g., "Backgammon Openings, Book B", on the roll of 4-2), and I am working on the doublets. I am also entitling my series: "Backgammon: Early Doubles," to minimize confusion. (The title refers to both kinds of "doubles:" doublets in the early game, and cubes in the early game.) Volume 1 will be on double 1s, Volume 2 on double 2s, etc. In the same year (1975, now), I was properly introduced to Scrabble by Lester Schonbrun, who kindly (and I mean that) trounced me regularly for very low stakes. I went on to play a fair amount of Scrabble during the couple years I was trading in Chicago ('76 and '78), and then took it up again when I moved to Seattle in 1990. I wrote/published a Scrabble newsletter (entitled "Medleys," which was also my phone number) from Jan. '91 to Dec. '93. My devotion to Medleys (which was profoundly time-consuming) probably broke my first marriage but otherwise it was loads of fun. Other hobbies? Volleyball, cats, piano, Thai food (can that be a hobby? ), and most of all spending time with my wife Hsiao-Yee for whom I'll never be able to find enough superlatives. I also love racquetball, though I don't play it like you do, Phil. So many top backgammon players have gone to poker, either because they like it or because there is so much money in poker. Have you considered that? How do you compare backgammon to poker? I've been on the edge of "giving in" to poker for a few years now. I've had great advice from Dan Harrington, Bill Robertie, Jim Pasko, Steve Sax, Stick Rice, Wayne McClintock, Hugh Sconyers, (and I apologize for forgetting anyone on the fly). I have read a book and a half, bought several more (unopened), and registered to play online but I still haven't played a single hand. So, I'm rather unqualified to compare the games. I suspect I will like poker less than I like backgammon (which is much of the reason I've held off), but I can't really make that determination until I've at least tried it. My, I'm really jumping around here. Perhaps my flashbacks and flash-forwards will keep things lively, though. Though all four siblings have kept up with music in some fashion, I'm the only member of my family who chose to pursue games. Chris is a software engineer, Ruth is a molecular biologist, and Katie is a piano teacher. No doubt that makes them smarter than me, but I have to wonder if they've had as much fun. My most interesting school experiences were in England, where I went to St. John's College School for Boys at the age of 11 and 13 (two non-consecutive years). The quality of teaching was much higher than I had experienced in the states, and I loved playing the rough-and-tumble sport of rugby -- often in the mud and rainin the afternoons. I was told I would love high school. I hated it. I was then told I would love college. I decided not to fall for it. As George W. once said in a speech, "Fool me once, shame on you; fool me twice [awkward pause] ... you ain't gonna fool me." Or something like that. I found a more productive way to spend my next several years (between and sometimes during my game bouts): smoking pot. You asked about the future. The only objective to which I aspire is catching up on my e-mailin the last month I've fallen way behind. I miss the checker recirculation games of the 70s. In the hopes of bringing it back, I propose "slot-gammon." The only rule change from backgammon is that you must give your opponent a direct shot with his back checkers on the opening roll. Slot-gammon leads to more exciting games. I have a lot of friends in backgammon who I would like to keep, so the safest answer is to mention someone who is no longer living. Chuck Papazian, who lived in the Bay Area at the time I learned backgammon, was something of a mentor for me. In part, I think it was because he looked like my hero: TV detective Columbo, played by Peter Falk. 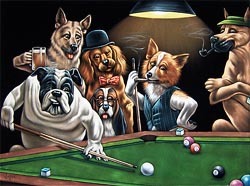 For the other part, Chuck looked like the bulldog shooting pool in a famous picture hung on my wall. Of the ones currently played, Nackgammon. But I'd really like to see slot-gammon tried. No, I think that covers it. What it boils down to is that I'm rather a dullard.